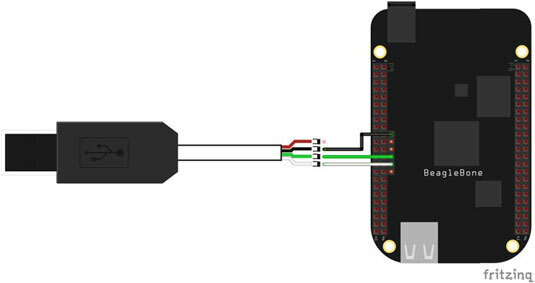 The serial port is a way to send data between the BeagleBone Black and another device. 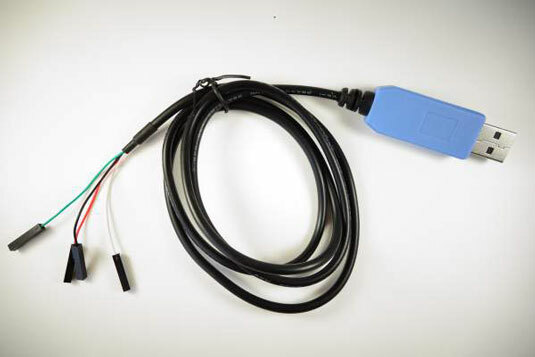 Establishing a serial communication between your computer and your BeagleBone Black requires a USB-to-TTL Serial cable. 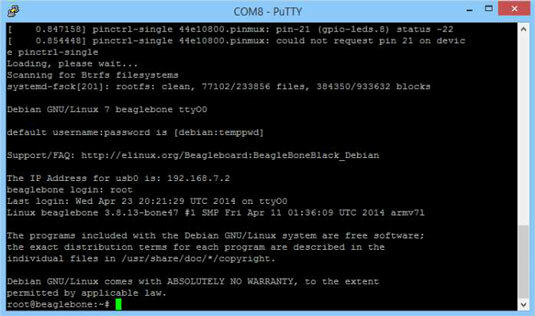 For most applications, connecting the BeagleBone Black via SSH over USB is the way to go. This connection technique allows you to send data to and from many devices other than PCs, which may be useful if you’re experiencing booting problems or networking issues. You can see what’s happening to your board right after plugging in the power with a serial debugger. Go to the free PuTTY download. Click the putty.exe file to download it. Run the putty.exe file to install the software. Connect the USB side of the TTL cable to your computer. In the PuTTY Configuration dialog box, select Serial. Type the name of your BeagleBone Black’s serial port. Open Device Manager to see the serial port’s name. Press Windows+R, type devmgmt.msc, and press Enter. The name of your BeagleBone’s serial port is listed below Ports. Power on your BeagleBone Black with a Mini USB cable. 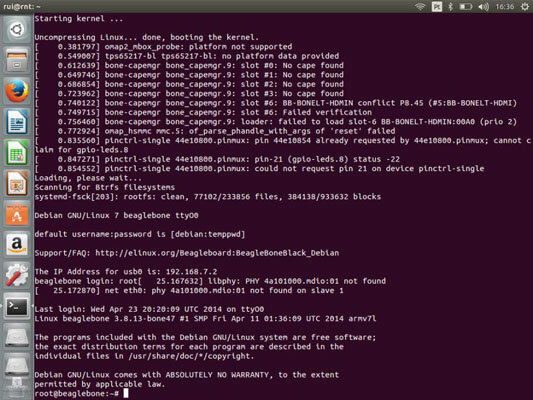 You see all sorts of information about the booting process. When you’re asked to log in, type root and press Enter. When you’re asked to type a password, press Enter. By default, no password is set. On a Mac, navigate to /Applications/Utilities and double-click Terminal to open a new Terminal window. 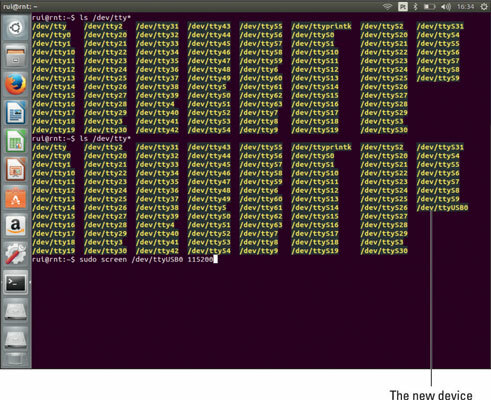 In Linux, press Ctrl+Alt+T to open a new terminal window. Now you can see a new device connected to your computer — in the figure, ttyUSB0. Type sudo screen /dev/ttyUSB0 115200. Enter your computer password, and press Enter or Return. When you’re asked to log in, type root and press Enter or Return. When you’re asked to type a password, press Enter or Return.